BiPolar, MS, and still as handsome as ever. I was diagnosed with Primary Progressive MS in 2010. As an extra treat, in 2005, I was diagnosed as bipolar. As you may see my brain is not working as well as it should. My father suffered the same disease and he was the same age as I (54) when MS really kicked in. The stories here can tell you more. Welcome. Atlanta was a fading glimmering sentinel of soon to be Super Bowl boredom as we headed out of the ATL and back on the road heading northwest. This was pretty much road time, but I did like the fact that as we drove on we touched in both North and South Carolina so we only missed Tennessee and Arkansas of the old Confederacy. Oh, well. All those new states west of Texas got off to fast start because, first there was no destruction from any wars (except wiping out Indian tribes) at least had a bunch of movies made there, and western stories, and there is only one - stranger comes to town, handsome, strong, wearing old jeans and a work shirt. He stops at the local bar to cool down, sees a pretty lady distributing food to customers, and she holds a some what weary look upon her face she returns to the kitchen. Bartender tells HERO that the girl is concerned about (relative/friend/property) and their imminent of any or all of what's in the parentheses. Enter BadGuy with various cronies, all of whom have useless gun skills. Girl comes, sees BadGuy, and before any ruckus, or minimal ruckus begins, HERO confronts BadGuy, the usual threats are made, BadGuy leaves, somewhat sore from falls and accidents that he had just happened, courtesy of our man HERO! More Threats! Cronies leave, also with new sores and boo-boos. Girl tells HERO the Terrible Thing that has befallen her/business/family caused by BadGuy. HERO finds a spot in what always seems to be a National Park for a perfect place to ambush or be ambushed by anyone, and of course he does,but eventually he kills all the nasty people,with a long wordy final showdown with BadGuy making the same explanation about everything but he's the villian and the story ends with HERO's arm around pretty lady. She now has to spend the rest of his days knowing he had killed anywhere 8 to 12 people the night before. But they never do. I'm not sure why I just sketched out a western thing, but if anyone wants to be the next Louis L'amour or Bob Johnstone/Will Johnstone, I hope there's something there for you. Or get Riders of the Purple Sage (the book, not the records from the 70's country/rock band - well, they are good anyway - Panama Red!). You can order from Amazon.com. The author of "Riders of the Purple Sage" is Zane Grey. We climbed slowly on the more mountainous roads but lots of green and horses and old mansions and historical markers that Doug zipped by before I could read anything was it. As I've said before, I have no pills remaining and Primary Progressive MS with a side of bipolar. Guess which wins? You're right, but let's all watch my decline and fall anyway. seats, which was so jammed full of bags and what not that anything that came close to the lower area was sucked into the black hole of The Bus (used as extra fuel if there hasn't been a Love's stop). So would try the iPod to listen to stories and it just made the snoozefest even bigger. Then spasm! Sometimes, if I'm really unlucky, i'd spasm my left arm just as Jackie is reaching for her drink. Who will win? Not me. If my head spasms to the right, knock myself into the bus window with a loud thud. If I spasm left, watch out, Jackie! Her iPod, book, any treat she is having will pop over to the seat across from us which I hope is not being used at the time. Sometimes no, sometimes yes. When the seat was occupied, we apologized to the rider immediately. "Don't worry," he or she would say, "we all do it." By the time we got home, the response was a heavy sigh. We rode a meandering trail up in to the beginnings of the Shenandoah Mountains, more history there to take in. Our tour guide regaled us with how nice and new accomodations would be, just finished, brand new, majestic views. We were also informed that the hotel did not have a dining area yet, but a bunch of old people are sure to find something at the new Cracker Barrel just across the street. There was just one problem, small, but there. They had no rooms. Sorry, filled up. As we had run into now and then on the trip, it being the middle of May, and in college towns, they have these called graduations. Families arrive, go see their kids be given a piece of paper that's says the kid is as smart, and after pictures, go out to dinner, and then go to the hotel. No motel. No food. Spasms in my arms and head. The passengers said the guide was taking wayyyyyy to long, and when she called Doug the bus driver to go into the lobby with her. Trouble is brewing. And my arms were folded in front of my chest to hold back my smoldering anger. The bus drove up a slate type mountain, and the Guide said we we're lucky to get the rooms at all. It was a three floor motel, not well constructed, and and to me it looked as if the motel had been just been dropped there by a black government helicopter. Welcome to Guantanamo, I mumbled, receiving a thump on my arm from Jackie. When the guide came back, she had the room IDs We all gathered around her to find some kind shelter from the storm (thanks for that, Mr. Dylan). We received our keys, and then the Guide said "You're on the third floor." Some fellow passenger said to his wife: "Hey, look at him! 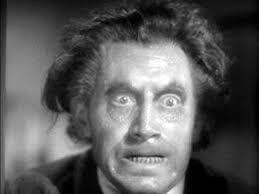 That's Spencer Tracy, from Dr. Jekyll and Mr. Hyde. We saw it at Troy Movie palace." The wife just said "No, we saw the Federic March one at Proctor's. I'm going to Burger King and getting nuggets. You want nuggets? Come on." After letting off the steam to the Yankee Trials guide and driver, the guide worked out a switch with another couple, and we could get the first floor. We dropped our luggage (or most of it - naturally mine was lost by the kind ineptitude of the staff). Since there was only one other building in SlateWorld, and the teeming rain made it an Olympic run for the League of Senior Avengers, and we all arrived inside shaking coats and hats which was a waste of time because even if you stayed in for an hour with a burger and fries, you'd be just as wet when you went back to the motel. We ordered and went back to the motel, clutching hamburgers and fries, and sodas. We plopped on the beds and consumed while watching a ball game. I was wondering, though about the people who work there. They can go on break, go outside, and see nothing. I hope the moon and stars and sun actually visit here sometimes, or is it always just rain? And so then a long night began.....a very long night. Hi. I'm Tom from upstate NY. I'm a retired government worker (thank you for my pension). I have a version of MS and am bipolar, and I write to explain to the "normals" out there what life is like with a brain that has no choice but to make you miserable. Fortunately, there is so much joy in life, that every now and then we all need a push to see it. I'm a pusher, and proud of it.